At Carroll College, We want our students to think like scientists. Our chemistry program teaches students to become independent and creative thinkers by solving problems, developing careful laboratory skills, critically evaluating data and communicating scientific data through written and oral presentations. Carroll chemistry majors have at their disposal a wide range of advanced scientific equipment, including a 400 MHz Bruker NMR. We have redesigned our curriculum to include a year-long senior level laboratory course, known as the Integrated Lab, that incorporates current scientific research and independent projects. the writing and speaking skills needed for effective scientific communication. In chemistry courses at Carroll, students integrate an atomic/molecular view of matter with principles from math and physics to learn: the properties and structure of matter, how matter interacts with itself, and how it is transformed in chemical reactions. 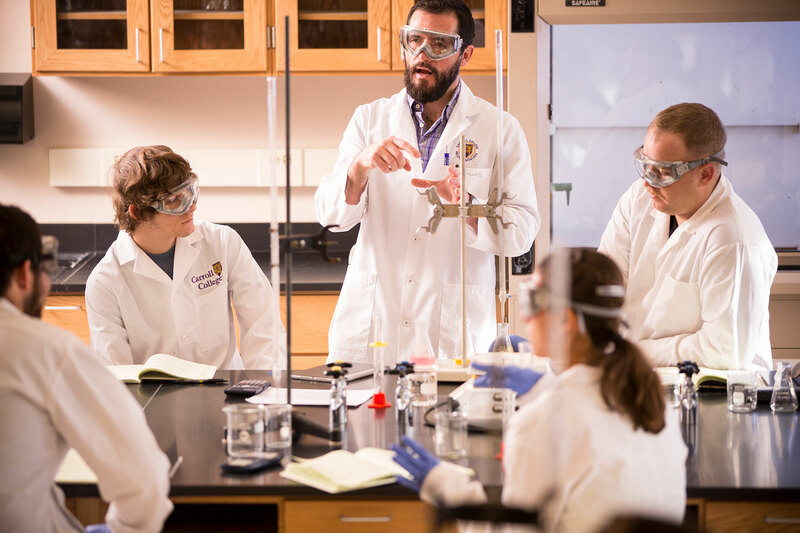 An emphasis on problem-solving and techniques is included at every course level; you can be assured that a chemistry degree from Carroll College represents a well-rounded and integrated educational experience. Students in the department also have ample opportunities to expand their knowledge through supervised independent undergraduate research at Carroll and in laboratories around the United States. A Carroll chemistry degree is designed to prepare you well for your next endeavor; it can take you almost anywhere. Many Carroll chemistry graduates have gone straight into medical school, Ph.D. programs, and pharmacy school, and others have found employment in research positions with the National Institutes of Health and Pacific Northwest National Laboratories. The kinds of employment and graduate and professional school placement that other Carroll chemistry graduates have achieved are broad and significant! Can you study abroad while majoring in Chemisty? Read Kerri McInnis' story. How about overseas undergraduate research? Chemistry student Isabelle Gray did just that in Germany. Can you receive awards for your chemistry research? Nate Burman and Lauran Palys did. Internships and research opportunities in chemistry abound! Take a look at what Carroll students have achieved during their undergraduate years. Life after Carroll is great for our chemistry graduates. Their pursuits include exciting employment, graduate and professional schools. Professor Kyle Strode finished 40th in his age group at the 2019 Boston Marathon - congrats Dr. Strode!